In this interview, performance artist and educator Kanene Holder discusses her train of thought when deciding what to write on her sign she was bringing to the Occupy Wall Street protest. She explains her decision to write Occupy My Womb: "I want people to be pregnant with questions. I want people to be occupied by questioning the status quo and questioning what we have accepted to be America, and so I decided to have a sign called Occupy My Womb because America should be a womb. America should be nurturing to all of its people to make sure that you and I can be the most that we can possibly be...So Occupy My Womb is a holistic movement, a holistic approach to really thinking about what it is to be alive in this country and to make sure that we occupy a future that is not bombarded by problems of our past." 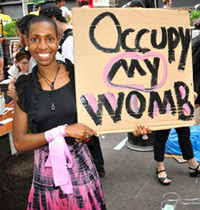 Watch the video below as Kanene discusses in further detail Occupy My Womb as well as her organization millions-served.com. Full Transcript: Hi, my name's Kanene Holder, and I was brainstorming about what my sign would be, and I get the fact that signs can be very direct, which means that experience with that sign is limited. Read the sign, get what they're trying to say, anti-corporate this, anti-co-opted government that, and you get it, and you walk on and move on, but I want people to be pregnant with questions. I want people to be occupied by questioning the status quo and questioning what we have accepted to be America, and so I decided to have a sign called Occupy My Womb because America should be a womb. America should be nurturing to all of its people to make sure that you and I can be the most that we can possibly be, and so I think about the fact that I'm 31, and if I have a baby and I watch my stomach swell over the days, weeks, and nine months, what am I going to tell my child when my child is birthed into this America right now? I'm going to have to explain to my child that I have to wait in a lottery line in order to maybe get my child into a good school? I have to explain to my child that they're more likely to be incarcerated than graduated? I have to explain to my child how to talk to the police because they might be stopped and frisked or they might be searched without a warrant? I have to explain to my child that yeah, there's a Declaration of Independence, which was an awesome way of structuring a new society with new ideas that respected the people? But yet, the media also portrays this as a motley crew and a mob? I have to explain those things to my child? I don't want to be preoccupied with having to give my child rationale for the status quo. 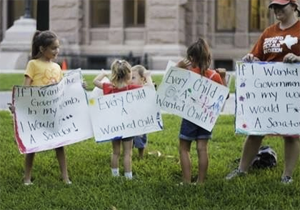 I want my child to be and know and believe that the America that is on paper is living, those founding documents are living, and they are living and they are occupying that space that was codified in the Constitution and in the Bill of Rights. So Occupy My Womb is a holistic movement, a holistic approach to really thinking about what it is to be alive in this country and to make sure that we occupy a future that is not bombarded by problems of our past. Occupy My Womb. If you'd like to know more, I actually am a performance artist as well as an educator, and I have a website. It's OccupyMyWomb.com, which I just bought the domain name, so I still have to put up stuff because I've been getting tons of inquiries about this, which is great, people are pregnant with questions. Also, millions-served.com because I live on 125th Street in Harlem, and there are four McDonald's on 125th Street between Amsterdam Avenue and Lexington Avenue, but in that same radius, how many quality engaging schools can you find? It's easier to find McDonald's. It's easier to go to Wal-Mart and get a flat screen high definition TV, and we have high definition problems. So that's what Occupy My Womb is all about. It's about questioning the reality. Millions are served, but what are they served? Millions are served what? What am i being served? What am I complacent with? What am I okay with? So that is what Occupy My Womb is all about. Then lastly, someone came up to me because I didn't even intend this. I thought womb because I love pink, so I put some pink in there and because I'm a performance artist, not a graphic artist, it got smeared, the black got smeared with the pink. Someone came up to me and was like, wow it matches, and I was like, yeah, I know it matches, but he also came up to me and said look, it's the same color as this, I said okay, and he said, this is the color when all three colors of the American flag are blended together, and that's the space that I would like to occupy in the future. The space where it doesn't matter, but we do not have that right now. We do not occupy post-racial America, we don't, okay. So, all of this is within the same movement, so I think this is like a beautiful sentiment and accidental because this is a cross pollination for a new nation. He came up to me with this cloth, and he was also attracted to me sign. So all of this is happening, and these are the types of discussions that we are having. I don't care what your political ideology is. I think we can all agree our children need to be educated because if not, it's affecting the GDP, okay GOP?